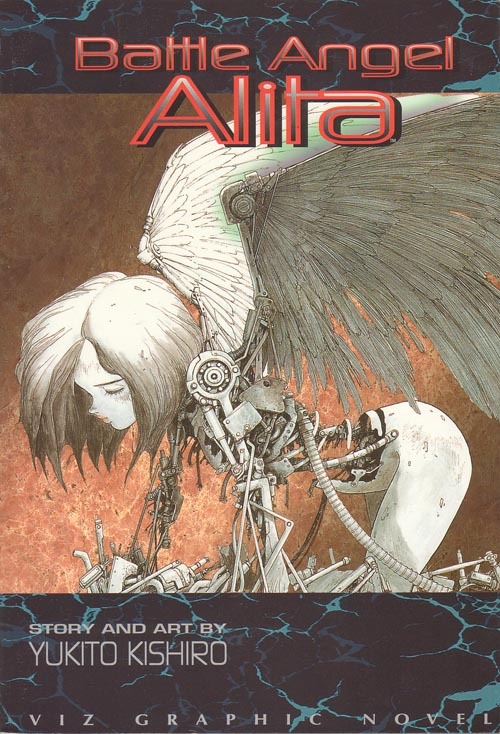 I feel I need to coin a new, admittedly dumb, phrase to describe my reaction to Battle Angel Alita: a guilty displeasure. I told you it was dumb. Ido Daisuke is a doctor/mechanic, and a damn good one at that. As far as I can tell, the source of his power is his colossal chin, which is magnificent in its magnitude. One day he finds half of a robotic female torso on a massive cyborg junkpile and decides to rebuild her. As her brain is still intact and this is the cybernetic future where flesh is a novelty, the process is a roaring success. The girl, christened Alita, has amnesia, which is understandable when your recent state was that of a head and a shoulder. Alita then sets out to discover herself and to forge a path in the bleak future with only her natural abilities and pronounced pout that never leaves her face. Sounds pretty cool, right? I thought so too. There are plenty of reasons why I should love Alita, such as the backdrop. The series is set in a far-flung dystopian future, where a giant floating city called Tiphares houses the privileged while everyone else lives upon the blasted wasteland that Earth has become. The story is set in the junkyard directly below Tiphares, which is a literal garbage site for everything tossed away by the city overhead. The author manages to avoid going over the top with how grim and dark it is, creating a plausibly bleak future world. The art plays a large part in the world-building — Kishiro puts painstaking detail into every character and part of the backdrop, bringing a richness to the world and making it all appear as a unified whole. Given the diversity in the buildings, people, and every small item strewn about in the panels, this is no small feat, and is quite simply arresting in its magnitude. You can get a real feel for the city just from a quick look at the rotting signs, the dirty streets, and the contents of every overflowing trashcan. The main reason I dislike reading Alita, though, is the cast, in particular the titular Alita and her dumb pout. All the main characters in the series have an invisible mantle that sets them apart, making them feel like tourists or guest stars. Their motivations and actions overshadow the rest of the cast and the setting itself, relegating them to being inconsequential extras. Ido is a good example of a character with this special quality, as in addition to being an expert doctor and cyber-surgeon he is an awesome bounty hunter to boot. All these details weigh the character down and take away any interest you may have had as he is so limitless in his abilities. Not only that, but he uses a rocket-powered sledgehammer as his weapon of choice, which is a damn sweet weapon but makes you wonder why no-one else has thought of the same idea. I know for a fact that I would have rocket roller skates and pimp rocket tonfa in the rocket-infested cyborg future. Alita is even more infuriating when it comes to shenanigans like switching motivations and changing her reactions to other characters at the drop of a hat. There is a very short side storyline where the doctor toys with the idea of marrying Alita, but this idea is thrown out the window in a very confusing conversation where character intentions do a 180 on both sides. So the good doctor chucks a wedding dress into a sewer in frustration, leaving me wondering where the hell he dug up a wedding dress in the blasted wasteland. This gets even nuttier with the appearance of the first main antagonist, who loves eating brains with his gigantic tongue. Okay, that's cool; I can get behind a slavering cyborg endorphin junkie. Sadly it doesn't take very long for the plot mantle to land on this person as well — Alita takes his body out in a cool but disjointed fight which costs her most of her cyborg body, displaying moves that the wounded doctor magically identifies out of nowhere as a robotic martial art, "Panzer Kunst," of which there are supposedly no users. Until now! Makakau, the antagonist, escapes from the fight scene with a sudden and rather contrived stroke of luck, quoting Nietzsche as he gets away. This is something you don't expect from someone reduced to a head-and-change, and takes you out of the drama entirely. Alita then receives a crazy body that was intended for military purposes that the good doctor had lying around conveniently. This — combined with Alita's super fighting style — smacks of the author trying really hard to make you care about the character, but giving her too many bizarre power-ups in the process. As the series continues events become more and more disjointed to the point that I was forcing myself to continue as I simply could not bring myself to care about the characters one jot. Multiple individuals whom I trust recommended the series to me, and so even though I didn't enjoy the first volume, I picked up the second in order to give Alita a fair shake. I can easily see how someone would have a different reaction to myself and utterly fall in love with the characters, the setting, and the outlandish storyline and read it over and over again. Sadly, even after repeated attempts to read the series, my negative reaction still remains. I would honestly suggest borrowing a copy of the first volume to see if it grabs you. If it does, then please feel free to leave a comment below outlining how I am crazy for not liking Battle Angel Alita. This review is based on a set of Viz graphic novels purchased by the reviewer.